You can watch all the Celebrity Cricket 2016 Matches Through Surya TV. Surya TV Will air all the Kerala Strikers Playing Matches, Semi finals and Finals. Sun Network is holding the telecast rights of Celebrity Cricket League 2016. In Malayalam Surya TV is showing the CCL 2016 matches, Sun TV in Tamil, Gemini TV, Udaya TV are the other channels showing ccl season 2016 matches live. Colors TV, Colors Bangla, PTC Punjabi, Big Magic Ganga are the other channels showing CCL 2016 Live Coverage. Title Sponsor for CCL season 2016 is Parle 20-20 cookies. Karbonn mobiles and Boost are the associate sponsors. Karnataka Bulldozers, Kerala Strikers, Mumbai Heroes, Punjab De Sher, Telugu Warriors are the teams playing this season. Opening match of CCL season 2016 is between Mumbai Heroes and Punjab De Sher. 23th January 2016 at 2.00 P.M is the date and time for Opening match of Celebrity cricket league 2016. This match will available live on Colors TV and PTC punjabi channels. 14 February 2016 is the date for Finals of CCL season 2016. You can check the complete schedule of Celebrity Cricket League 2016 from Here. Kerala Strikers team playing the first match at ccl 2016 on 23th January 2016 against Telugu Warriors. Gemini TV and Surya TV are the channels showing the Kerala Strikers Vs Telugu Warriors match. 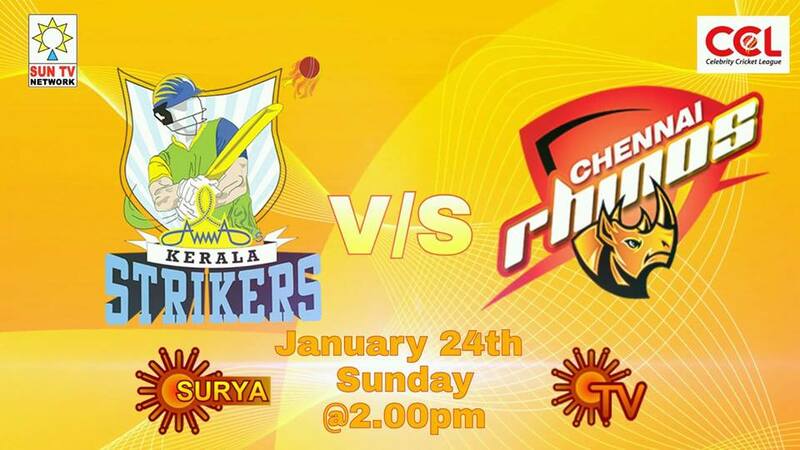 Surya TV Will telecast the live coverage of All the Kerala Strikers Playing matches. There will be 3 matches for Kerala Strikers in the 2016 Season of CCL. Second match of Kerala Strikers Team is Against Karnataka Bulldozers and the 3rd is against Telugu Warriors. If they qualified to semi finals you can check those matches also on Surya TV.